Why are there so few Women in the Sciences? That is, why are there so few women in the hard STEM fields that involve high-level mathematical and spatial-visual cognitive ability? The Cultural Left, the Liberals and even some Conservatives have offered various explanations for this, but most of their theories are false or feeble, and some on the Cultural Left are basically unhinged conspiracy theories. As it happens, there is a straight-forward scientific explanation, and backed up by a mountain of scientific evidence. Unfortunately, it requires looking at the nature of IQ, or intelligence, in men and women, and, of course, this causes bilious, almost deranged howls of outrage in our culture, mostly from the Left. But, if you bear with me, you can understand in this short post what the vast majority of people don’t understand (and even refuse to understand or believe if they are told the truth). (1) Culturally unbiased, fair IQ tests measure a person’s general faculty of intelligence, or what is now called Spearman’s g (general intelligence), which is clearly a unified, single cognitive trait of human beings. It appears that IQ (which measures general intelligence) is about 70–85% heritable in adults. The heritability of IQ rises with age, so that by the time one is an adult perhaps as much as 80% of IQ is heritable (Plomin and Spinath 2004; Plomin and Deary 2015). Even the liberal/leftist American Psychological Association (APA) admits the overwhelming evidence for this (see Neisser et al. 1996: 96, which accepts the 0.75 figure), and the democratic socialist James R. Flynn (after whom the “Flynn Effect” is named) – the leading environmentalist on gaps in IQ between population groups – himself accepts that current evidence shows that the heritability of IQ in adults is probably about 0.75 (Dickens and Flynn 2001: 346). (2) When the IQs of a representative sample of men and women are plotted on a graph, it has been discovered that the distribution of IQs is not the same. 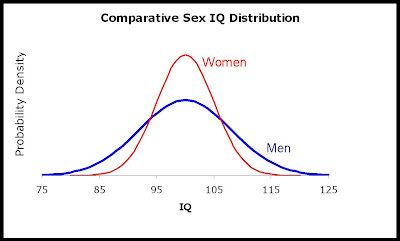 See the graph of male and female IQ distribution here. As we can see, the manner in which the IQs of men and women fall on the graph differs: the IQ scores of women tend to cluster around the average (with less distribution in upper and lower ranges), while male IQs tend to be distributed less around the average and more in the upper and lower ranges as compared with the IQ distribution of women (see Hedges and Nowell 1995; Lubs 1999; Roberts 1945; Deary et al. 2007). The average IQ for European people is about 100. So, for example, more European women have IQs that tend to cluster around 100 than the IQs of men do. This means that, numerically, there are far more high IQ men than there are women (also, it means there are far more low IQ men than there are women). Furthermore, it means that, numerically, there are fewer men of about average IQ than there are women. (3) in addition, there is probably a small difference between the average IQ of men as compared with that of women (Lubs 1999; Johnson and Bouchard 2007; Nyborg 2005). Men appear to have a slightly higher average IQ, with about a 3–5 point advantage over women – though, admittedly, that is not large. It is still correct to say that the average IQs of men and women are not greatly different. (4) by examining the sub-tests of IQ tests, we have discovered that – in terms of sub-tests and specific cognitive abilities – men and women also differ. Women tend, on average, to be much better at verbal abilities and language, but men tend on average to outperform women on numerical/mathematical and spatial cognitive abilities (Neisser et al. 1996; Wechsler 1958: 144–149; Lubs 1999; Johnson and Bouchard 2007; Johnson et al. 2008; Halpern et al. 2007). The fact that the intergenerational Flynn effect – which has been working for about a hundred years – hasn’t eliminated these IQ differences between men and women should alert us to the truth that the differences are mostly genetic, not environmental. So why are there so few women in the sciences? First, science requires a high IQ. But the IQs of women tend to cluster around the mean of 100. Because many more men have IQs well above 100 than women, numerically there are not enough women to compete with men in the sciences. The slightly higher average IQ of men also contributes to this. Secondly, science also requires a high level of mathematical and visual-spatial cognitive abilities, and here on average men outperform women. Thirdly, science tends to attract human beings with an interest and ability in mathematics, spatio-visual abilities, and propensity to do abstract, impersonal work, which is much less focussed on human beings, or on social/verbal interaction between human beings. There are also general psychological and behaviour differences between men and women that affect each gender’s educational choices and career choices. Women are better at verbal/language abilities, and have a general propensity to choose professions where they can use those abilities. Thus the hard sciences appeal to men far more than to women. Therefore, generally speaking, even high IQ women tend not to be interested in the hard sciences. When women do go into the sciences, it tends to be in biology or medicine, where they can use their superior verbal skills, while women tend to avoid other STEM fields that require a more intense mathematical and spatial cognitive ability. By contrast, men excel at physics, chemistry and engineering, where greater numerical and spatial cognitive abilities are required (see Johnson et al. 2004). The reality of few women in the hard sciences, then, has a mainly biological explanation, which is grounded in genetics and Darwinian evolution. In short, it is explained by the biological and genetic differences between men and women. This is precisely why not only in the past but also to this day modern Western science and scientific discovery is driven mostly by high-IQ men, not women. Of course, this biological explanation does not rule out influences from culture, institutional factors, discrimination, and government policy either. But these are likely to be minor or even trivial factors, while the major factor is biology. Crucially, while none of this necessarily rules out the moral case for equality of opportunity for women, it totally destroys the feminist aim of total gender equality of outcome in all employment, professions and intellectual life. Moreover, it follows logically that the conventional explanation for the failure of women to attain a 50% presence in all higher professions because of some evil institutional gender discrimination and sexism in Western societies is manifestly absurd. And nobody scientifically literate even in a layman’s sense should be surprised by any of this. (6) on average, men are more competitive (because of higher levels of testosterone) and more aggressive than women. This is also why women, on average, simply cannot work at certain jobs that require hard, strenuous, extended physical labour in the way that men can. Once again, these facts of human social life are explained largely by biology and genetics. But try saying this in public, or in academia, or in the media. The response will be a hysterical, vicious, witch-hunting wave of public abuse, persecution and, if the person in question is of high-profile or status, probably the ruin of that person’s career. This is how anti-scientific and insane our civilisation has become. The fault lies mostly with the Cultural Left and feminists too. But the mainstream Conservatives aren’t any better either. Modern conservatives – who are rightly derided as “Cuckservatives” (from “cuckold conservatives”) by their own enemies on the right – are so useless that they cannot even defend basic scientific truths about the biological differences between men and women. The belief that “Diversity is Strength” is pretty much an Orwellian cry of the modern world. Let us take the average multiculturalist Conservative, multiculturalist Liberal, or multiculturalist Leftist, Cultural Leftist, or multiculturalist Marxist. We can assume that you are vehemently in favour of diversity and immigration – and that you think diversity is the greatest thing ever. With respect to Western countries in Europe like Britain, France, Germany, Sweden, or Belgium, how much diversity is enough? Is there any limit to diversity? For example, is the pro-diversity Leftist or Conservative willing to set a limit at which we have had enough diversity? 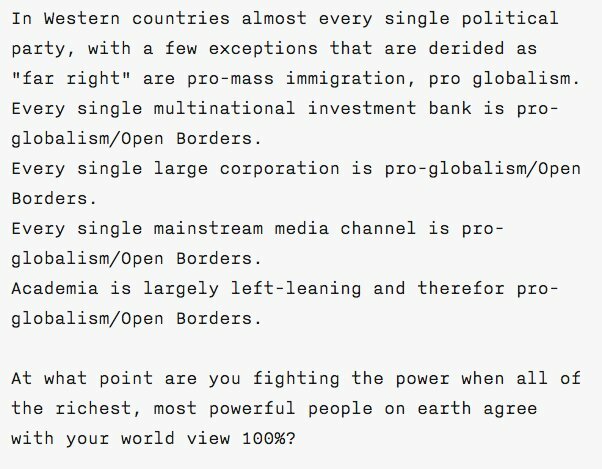 I would like to see the pro-diversity multiculturalists – whether Conservatives or Leftists – answer this question. 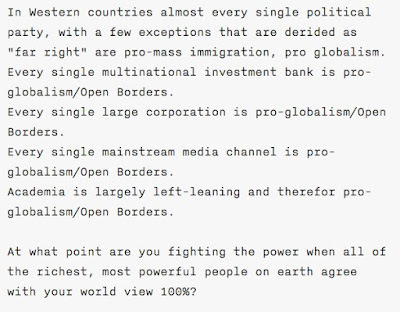 How much diversity in the West is enough for you? And, importantly, are you also calling for similar levels of diversity in African nations, Muslim Middle Eastern nations, Israel, India, South-east Asian nations, China, Japan, and South Korea? A minor point: I don’t think it is correct to say that the banks, when they create a new loan, record their liability as a “fictitious deposit.” Instead, the new demand deposit is technically and legally an IOU or promise to pay, but also a type of credit money, so that new demand deposits expand the broad money supply. I don’t accept Werner’s “quantity theory of credit” either (you can listen to a talk on the subject here), because it concedes too much to the flawed Neoclassical quantity theory. However, the point that our modern financial system – because it has been so poorly regulated and deregulated – is driving asset price inflation by credit bubbles is absolutely correct. This sounds excellent to me, and much better than the disastrous Neoliberal attempts at population replacement, which is now being pushed by the United Nations.